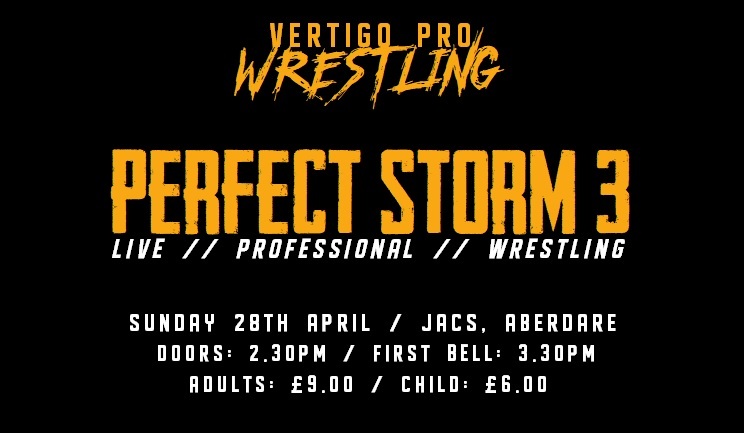 This April join Vertigo Pro Wrestling as we once again enter a Perfect Storm! "There was 15 of us, 4 adults and 11 children. we all enjoyed it and this was my 4th time. Its a really fun and value for money night out and we would highly recommend vertigo wrestling." "Super time had by all. Great banter and crowd interaction. Fantastic venu Will be advising friends to come along ðŸ‘ðŸ» Kids wanted photos with wrestlers near or in the ring. ðŸ‘ðŸ»"
A really good show for such a small venue. The action was good in the first half, but utterly breathtaking in the second. Two very well designed championships were up for grabs, with the Vertigo Pro Championship feeling very prestigious. The crowd interaction was great from the wrestlers. rnThe merch on offer was good, but I was disappointed that there wasn't an A3 poster of the event that I could purchase and then have the wrestlers sign, as I really enjoy collecting these as memorabilia for that specific event. Maybe cutting down the time from doors opening until the first bellfrom 1 hour to 30 minutes, as that hour dragged by slowly waiting with excitement. All the wrestlers were very friendly when meeting them and you could tell that they really wanted to be there. I look forward to the Vertigo Pro Championship being able to be defended in any promotion as well as at VPW. I really look forward to a return to Aberdare, as the closest promotions to me are Attack Pro Wrestling and Dragon Pro Wrestling, in Cardiff and Newport respectively, and they are difficult to get to and from late on a Sunday night. It was great having a promotion be in Aberdare, as we haven't had one since Welsh Wrestling visited back in 2014. Overall, an amazing show that I couldn't be any happier that I attended. Will definitely be coming back.